Renewable Energy Consultancy Agency, Corp. The best equipment and committed services for Energy and Automation. Cost effective, high efficiency, low maintenance and reliability are the main features of our supplies. We dream it, we plan it, we build it and we run it! 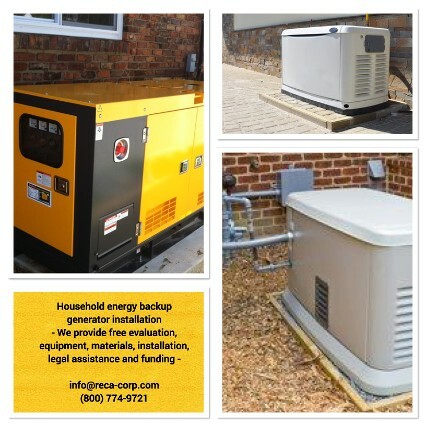 Either you are an individual or a commercial costumer, RECA has the proper loan program for your emergency energy backup project. Easy straight short application procedures with funding withing 36 hours are the recurring election of the costumers. Small private projects owners generally qualify for our 20k six moths free interest program while larger project apply for our 100k commercial loan credit line. We still look forward to engage with our costumers in larger commitments where we are able to finance up to 5 millions dollars. Please click on the links below to download our loan application forms and submit them to info@reca-corp.com once they had been completed.